Party Down with #SweetXmasBox Authors! I’m happy to share that fourteen members of Sweet Romance Reads are hosting a party to celebrate their new boxed set and you’re invited! Sweet Christmas Kisses: Fourteen Sweet Christmas Romances is a collection of heartwarming stories that will take you from small-town USA to England, Scotland, and even Ecuador; from the beach to snow-capped mountains, and to the wild—sometimes magical—west. I couldn’t be more excited to have participated in this project with fellow talented authors Donna Fasano, Helen Scott Taylor, Beate Boeker, Melinda Curtis, Denise Devine, Raine English, Aileen Fish, Patricia Forsythe, Grace Greene, Mona Risk, Roxanne Rustand, Magdalena Scott and Kristin Wallace. All of us are coming together, alongside some fab guest authors, to celebrate the bundle’s release on Tuesday, September 30th from 3:00 pm to 10:00 pm ET, right here at Sweet Romance Reads on our Facebook page. 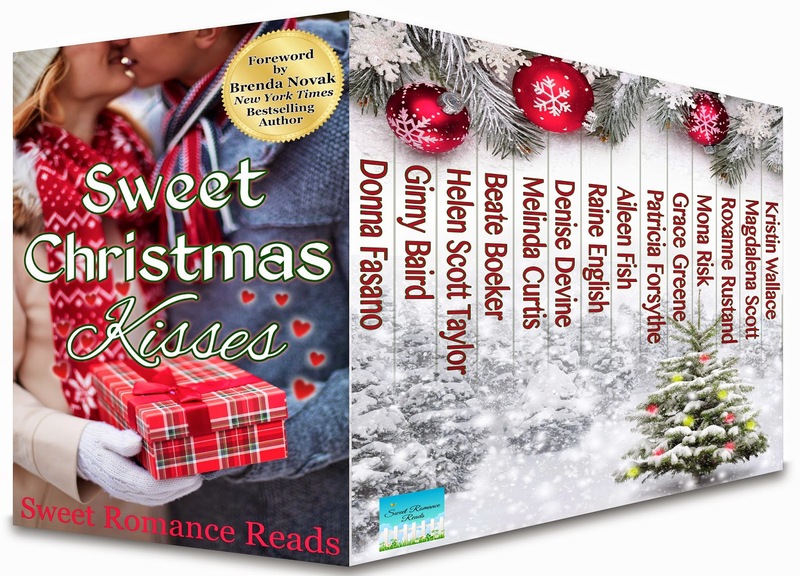 Sweet Christmas Kisses: Fourteen Sweet Christmas Romances is currently available for Pre-Order at the following vendors: Amazon, Kobo, iTunes and Google. Coming to Barnes and Noble release day, September 30th 2014. This anthology is so cool--1,600 pages of full-length novels and novellas on sale for only 99 cents. It's like a Christmas gift for romance readers who enjoy sweet romance, and even has a forward by outstanding author Brenda Novak! I hope lots of people who stop in at the online FB party--there are SO many prizes to win! It is a really great project, Roxanne. I'm so thrilled to have been involved in it. I hope we have lots of party attenders, too. It's going to be fun! Who can pass up a good party with lots of Christmas Cheer?! Count me in! I can't wait! I've enjoyed being a part of this book. It's been fun to be involved with this project. Can't wait to see what happens on Tuesday, release day. This is going to be such fun! Can't wait. It is going to be a blast.